Educare has tracked program quality and child and family outcomes with the Educare Implementation Study since 2005. Every Educare school participates in this study as part of its ongoing program operation and improvement efforts. We partner on the study with researchers from the Frank Porter Graham Child Development Institute at the University of North Carolina at Chapel Hill and local research institutions in Educare communities. 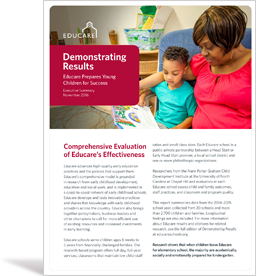 Our Demonstrating Results report contains the most recent findings from the Educare Implementation Study. Read the report. The evaluation also provides policymakers, practitioners, funders and others in the early childhood field with hard evidence to demonstrate the impact of high-quality early learning experiences for low-income children and families. The majority of Educare parents report engaging with their children at least three times a week in activities like talking to them about their day at Educare, teaching them letters or numbers and reading to them. Children who enter Educare at younger ages have higher levels of receptive vocabulary skills at kindergarten entry than children who start Educare later. Dual-language learners benefit even more from earlier entry and longer involvement in Educare, demonstrating stronger gains in English language ability. Educare’s intentional focus on building children’s social-emotional skills before age 3 and continuing through age 5 works. More time in Educare is associated with higher ratings of social-emotional skills, including teacher-rated self-control and initiative, among most children. To learn more about the Educare Implementation Study, please read our National Research Agenda for Early Education. 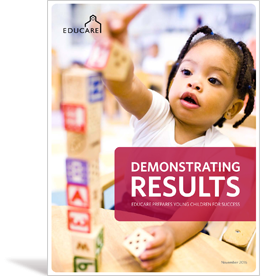 Read the executive summary of Demonstrating Results. Read the full report of Demonstrating Results.